Freebie Friday Week 9 ! So basically, if you are a Moo fan, this is your last chance to grab one for Christmas!! The Slumber Pack contains a Square Hammock (38 x 38cm), a Corner Hammock (38 x 38 x 48cm), and a Slumber Tunnel (45 x 20cm) – it’s a great set which offers lots of snoozing choices, it looks great in the cage and is especially useful for groups of animals who are rubbish at sharing! 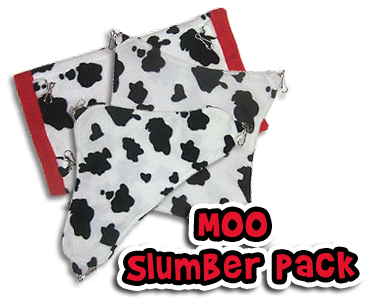 All you need to do is leave a comment on this post telling us why your Pet would like to win a Moo Slumber Pack. Comments will be closed on Wednesday 7th of December at 23:59 GMT and the Winner will be drawn (by Random.org) and announced shortly afterwards. I would love this set for my pigs to make up for their impending vet visit..
My piggies would love this! My furballs used to have this design and wore it out too much! They would love to bring back the moo deco in their cages! It’s definately one of the best designs out there! My chins LOVE their hammock and spend hours in it snuggling up and I think they would love a tunnel in their cage also! Molly would love a Moo Slumber Pack because her aunts are cows. My chinchilla Pablo would love those! they would match his fleece bedding which is the same pattern! My guinea pig Poppy would love this black and white set to camouflage herself when it’s nail cutting time! My Guys would absolutely LOVE a new slumber pack!!! My degu Maude IS a lazy moo – she’ll happily doze in my hands for hours. If she wins a slumber pack she might relocate long enough for me to feed her four sisters. I love moo stuff! my guys would love them for an xmas treat. I’m a big fan of moos, so much so that I don’t want to exploit them (or any other animal) so I’m vegan ;). Cow’s were always one of my favourite animals growing up. They’re so beautiful. My rescued ratties would definitely appreciate some new comfy furnishings! My three rats love to have the option of sprawling out in separate hammocks or cuddling up in the same slumber tunnel. Plus, two are white and one is black – how’s that for moo colour coordination? Chilli will love the pack because just like me he is a sleepy little fellow who just loves to slumber all day. Cuddle, cuddle, snuggle, snuggled, z, z, z. My little Gremlin hamster would love this to go in his cage. He has a rat cage so needs alot of hammocks to prevent nasty falls, he’s getting bored of his current ones so would love this set for his house! My two chinchillas would love this for Christmas, with the cold winter days coming they would love to snuggly up in complete complete comfort. Our slave needs some new slumber tunnels and hammock for me too snuggle up with my 2 lovely ladies Lila and Kiwi. One of my girls has chewed all the ones with have. Yoda. My lovely little degu family would love the moo slumberpack to pile into for snuggles! My 2 adopted chins Butch and Sundance are pretty good at sharing, but also like their own space! So this pack would be great! My 3 fluffballs Scampi, Mickey and Mya all adore the range of hammocky hammock beds and love snugs they’ve been sleeping in since discovering HH. And after the last few months with Scampi being really poorly with sinusitis and Mya and Mickey feeling a bit unloved, this would make a perfect early Xmas present as they could have one each!